These are the voyages of the starship Potemkin. Her five year mission: Explore strange new worlds. Seek out new life, and new civilizations. To boldly go where…. Oh, let’s cut the nonsense…. Project: Potemkin is a series of Star Trek fan films made by a group based in southwestern Georgia. What sets them apart from almost every other fan film is that there is some real talent involved. No one you are likely to have heard of (of course), but people with some real acting and production experience. For example, Jeffrey Green (Captain Alec Grigory and Director of Photography) is the Chair of the Dramatic Arts Department and Artistic Director of Rylander Theater Partnership Productions (among many other things) and has been acting since the 1980s. You can easily tell that these people know what they are doing even before an episode begins. The music is well done, and is appropriate to the action. I would also like to point out the quality of the sets. Yes, the Captain’s Office could be a small room anywhere – perhaps a spare room in someone’s house. And the bridge set looks like it could fit in someone’s garage. But the attention to detail, especially on the bridge consoles, is amazing. They actually look like something you’d expect to see on a Federation starship. They don’t confine themselves to their sets, either. Quite a few episodes are shot in interesting locations in Georgia; the variety of landscapes and settings make for reasonably convincing alien worlds (especially with the help of a little post-production effects work). Although they have done a full one-hour episode, almost all of them are more like “vignettes”. They get a story idea, and write a script based on that idea that is no longer than it needs to be. This allows them to cover everything from character drama to humorous looks at life on an aging starship. Another benefit of the format is that it doesn’t ask too much of the cast or crew. These people are doing it for fun, not the money. It’s very easy to forgive the occasional wooden acting. They have just started their third “season” at this point, and since they are open to script submissions from their fans, it looks like they could really be on a five-year mission. At least. The videos are available – for free!!! – at YouTube and Vimeo – or direct download in multiple formats. Though to be honest, I’d actually be willing to pay for a “collected season” on DVD. The episodes are that good. Oh, if I may overthink the series for a little. In vignette S01-B, “Care for a Lift?”, we are informed that Project Potemkin is a plan by Starfleet to see just how long they can keep a starship going beyond its normal “lifespan”. Frankly, I’m not sure that’s something Starfleet would really try to do. For if it is found that starships can function effectively for much longer than originally thought, then there’s nothing to keep Starfleet’s budget from being cut. And as we all know, no government department – military or civilian – ever wants to have its budget cut. In fact, one can argue that you determine the success of a government department or program by the size of its budget. So I figure that someone in the Federation is shoving this project down Starfleet’s throat. In response, and in an effort to sabotage the project, Starfleet is using what it does have complete control over – crew assignments and missions. 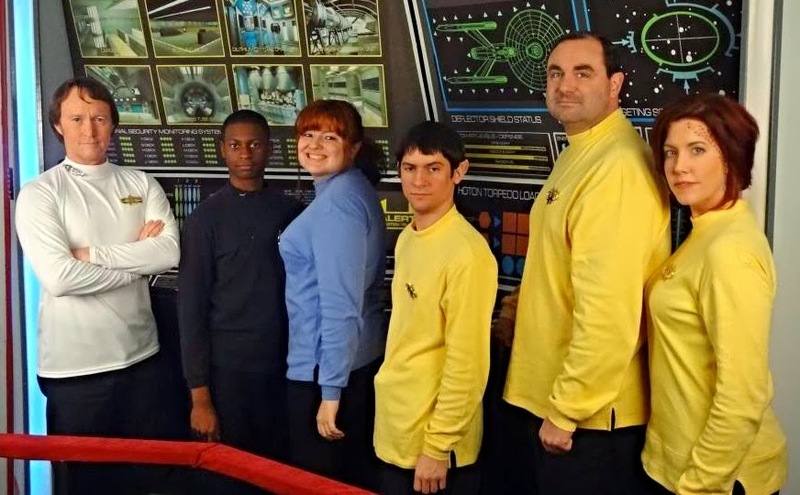 Starfleet is deliberately filling the Potemkin with fresh Academy graduates (ones not near the top of the class, obviously), older crewmembers on their last tours of duty, and “misfits” whom Starfleet doesn’t know what else to do with. Then, the ship is sent off to the edges of Federation space where they will be far from help, and presumably also where their screwups won’t cause too much damage to the Federation. So you’ve got a crew with a lot of energy and excitement, experienced people who know all the short cuts and work-arounds, and people with creativity and a devil-may-care attitude. Despite Starfleet’s best efforts, that’s a pretty decent combination for actually dealing with all the crappy and risky assignments the Potemkin gets. Let’s hope Starfleet doesn’t realize that for a while, and we will continue to get many more fine tales of the Starship Potemkin in the future. L – R: Jeffrey Green (Capt. Alec Grigory), Richard Thornton (Lt. Darrell Frazier), Hannah E. Ruiz (Lt. Doreen Spampinato), Jason Ryan Wallace (Ens. Sonaj), Doug Harper (Cmdr. Mike Delaney), Sara Higgins Mackenzie (Yeo. Ziandra Yanari). This entry was posted in Reviews and tagged Movie Review, Project Potemkin, Star Trek. Bookmark the permalink.